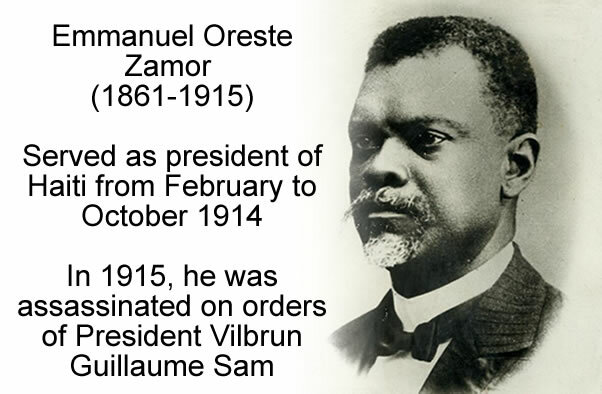 Emmanuel Oreste Zamor (1861-1915) had served as the Haitian President in 1914 for a little over 8 months (February 8, 1914 - October 25, 1914). He was the leader of a countryside army called 'Cacos' that often took part in rebellions. The Cacos supported Zamor because he had promised to keep them on the government payroll. Zamor and his government were facing a rebellion that grew louder every day in the North. Oreste Zamor himself took the head of his troops to the North, however, he had to retreat. When he came back to Port-au-Prince, his responsible cabinet members were rushing for foreign legation. He was arrested by his successor Guillaume Sam who overthrew him and locked him up in the National Penitentiary. Zamor was murdered along with other 167 political prisoners.